Rail bosses are in line to receive multimillion-pound pay packages this year, as passengers face inflation-busting fare hikes, delays and strikes. 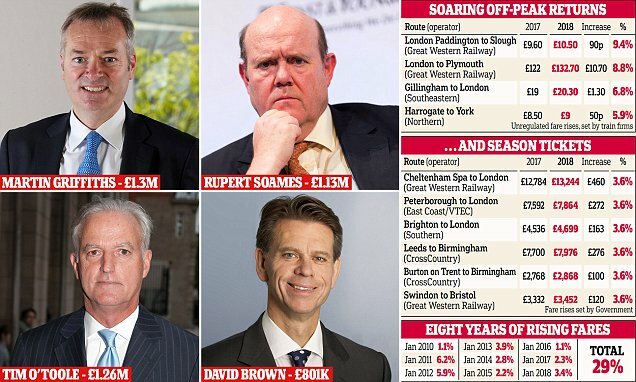 A Daily Mail investigation reveals some executives could earn as much as £5.4million despite a year plagued by engineering works, poor service and the worst strike disruption in decades. Tomorrow, passengers will be hit by an average fare increase of 3.4 per cent – the biggest in five years. It will add hundreds of pounds to the cost of some season tickets. Travellers buying off-peak fares or planning long journeys could be hit by even bigger rises – up to 10 per cent in some cases. Despite this, the bosses that run Britain's biggest rail franchises are set to earn huge seven-figure packages. The bumper pay deals for 2017/18 include a package worth up to £2million for Great Western Railway's Tim O'Toole and up to £2.5million for Martin Griffiths, boss of Stagecoach, which runs East Midlands and part-owns the Virgin East Coast and West Coast franchise. Rupert Soames, chief executive of Serco, which operates the Caledonian Sleeper and part controls Merseyrail, is in line for a maximum pay package of up to £5.4million if he hits all his performance targets. Steve Double, Tory member of the Commons transport committee, said: 'I would expect some restraint … in terms of fare rises.